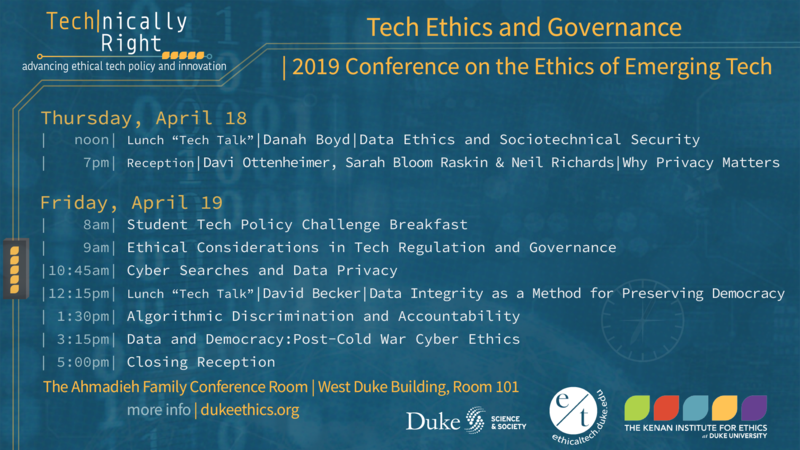 Technically Right at the Kenan Institute for Ethics is proud to host: “Tech Ethics and Governance: 2019 Conference on the Ethics of Emerging Tech.” Emerging tech–including AI, algorithmic decision making, predictive analytics, cybersurveillance, and cyberwar–is forcing a re-evaluation of the relationship between the citizen, the state, and tech corporations. The shift of power invites a robust dialogue on the ethics of the deployment of these technologies and their impact. This conference will examine the ethical considerations that attach to the increasing reach of emerging tech, and the regulatory and tech governance models necessary to protect an open democratic society. | Meal RSVP’s are now closed. Welcome and Introductions by Suzanne Shanahan, Director, Kenan Institute for Ethics (Duke). Presentation of thank you gifts to Ed Ballesien, Jonathan Wiener, and Lori Bennear. Remarks on Rethinking Regulation by Ed Balleisen and Jonathan Wiener. Moderated by Margaret Hu. Speakers Davi Ottenheimer, Professor Raskin, and Professor Richards will help to forecast and frame the themes of the conference, including: (1) how best to regulate and govern emerging tech in ethical ways; (2) data privacy and information security; (3) algorithmic decision-making and accountability; and (4) cyberwar and information warfare.